1. In the default state, the "Off" Display button will be highlighted. 2. When you are ready to turn on your display, press "On". 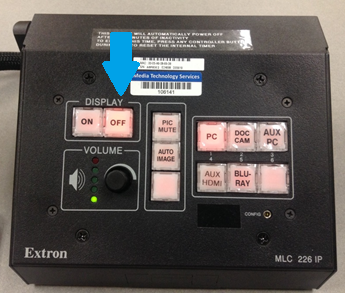 It will begin flashing until your display (SmartBoard, Projector, etc) is fully powered on. 3. 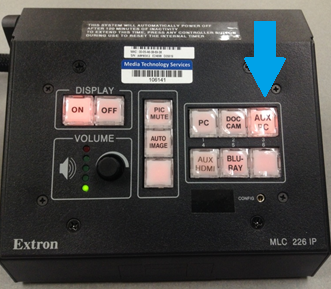 Once your Display is on, you may select a source from the right hand side by pressing the proper button. The selected source will then light up red. Please wait a few moments after pressing the source button for it to switch. 4. 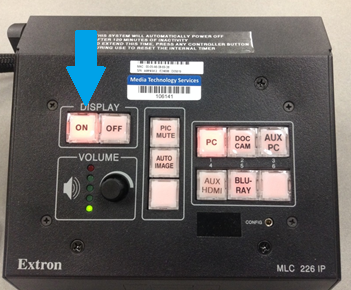 If you wish to adjust the volume in the room use the "VOLUME" knob. 5. 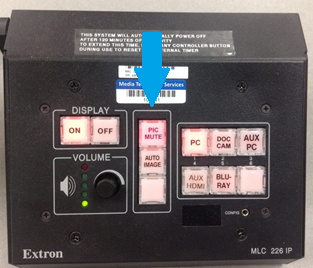 If you need to temporarily disable viewing of your source, press the "PIC MUTE" button in the middle column. The button will begin flashing and your Display will show a black screen. To resume, press the "PIC MUTE" button again. 6. When you are done, turn the display off by pressing the "OFF" button. It will begin flashing until the display is fully powered down. Please wait until the button is done flashing before attempting to turn it on again. 4. 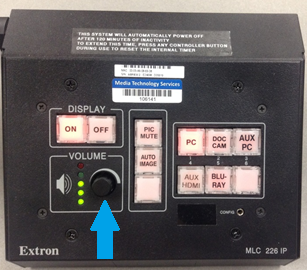 If you wish to adjust the volume in the room use the Volume knob.